High levels of mineral reserves are a contributing factor in the 20+ year violent conflict in the Congo. 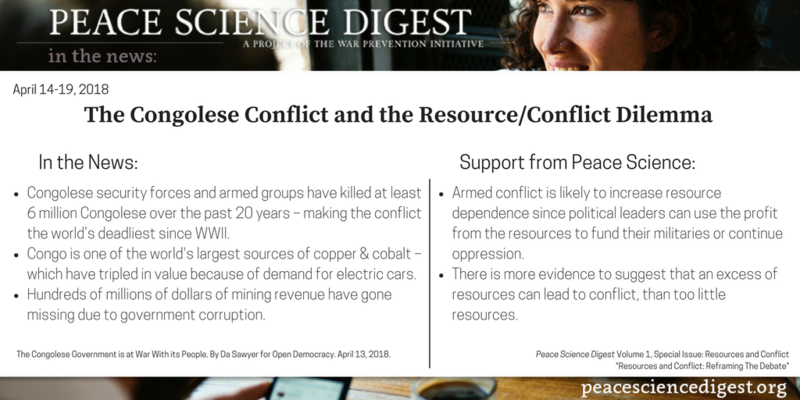 Peace Science shows the link between natural resources and conflict, and how government income from natural resources can lead to more deadly, longer lasting, conflict. The Congolese government is refusing to support a United Nations-led initiative to raise $1.7 billion for emergency assistance to over 13 million people in Congo affected by recent violence. Government officials deny that there is a humanitarian crisis. This appears related to a sinister attempt to attract foreign investment and further enrich those in power, while avoiding outside scrutiny. Congolese security forces and armed groups have killed thousands of civilians in the past two years, adding to at least six million Congolese who have died from conflict-related causes over the past two decades – making the conflict in Congo the world’s deadliest since World War II. Today, some 4.5 million Congolese are displaced from their homes – more than in any other country in Africa. Tens of thousands have fled into Uganda, Angola, Tanzania, and Zambia in recent months – raising the spectre of increased regional instability. Congo is Africa’s biggest copper producer and the world’s largest source of cobalt – which has tripled in value in the past 18 months because of the demand for electric cars. Hundreds of millions of dollars of mining revenue have gone missing in recent years, as Kabila, his family and close associates have amassed fortunes. While Congo’s immense mineral wealth could help address the emergency and other basic needs of an impoverished population, income from any new investments are more likely to end up in the pockets of those in power. There is more evidence to suggest that an excess of resources can lead to conflict, than too little resources. Armed conflict is likely to increase resource dependence since political leaders can use the profit from the resources to fund their militaries or continue oppression. Every conflict needs to be examined within its own dynamic social context in order to understand the role natural resources play. “The Congolese Government is at War With its People”. By Da Sawyer for Open Democracy. April 13, 2018. Next article Can We Fight And Broker Peace Agreements At The Same Time?